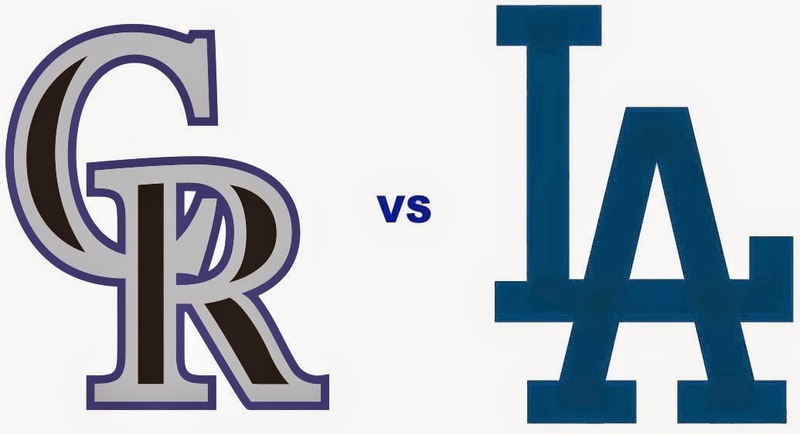 Dodgers Blue Heaven: Rockies Series Starts on Monday - Stadium Giveaways, Pregame Info and Other Stuff! Rockies Series Starts on Monday - Stadium Giveaways, Pregame Info and Other Stuff! The next homestand starts on Monday against the Colorado Rockies. Below are some odds and ends for this upcoming homestand. 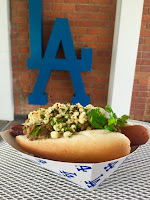 The Colorado Chile Verde Dog will be available for this homestand only against the Rockies at the Extreme Loaded Dog concession areas located on the field, loge and reserve levels. 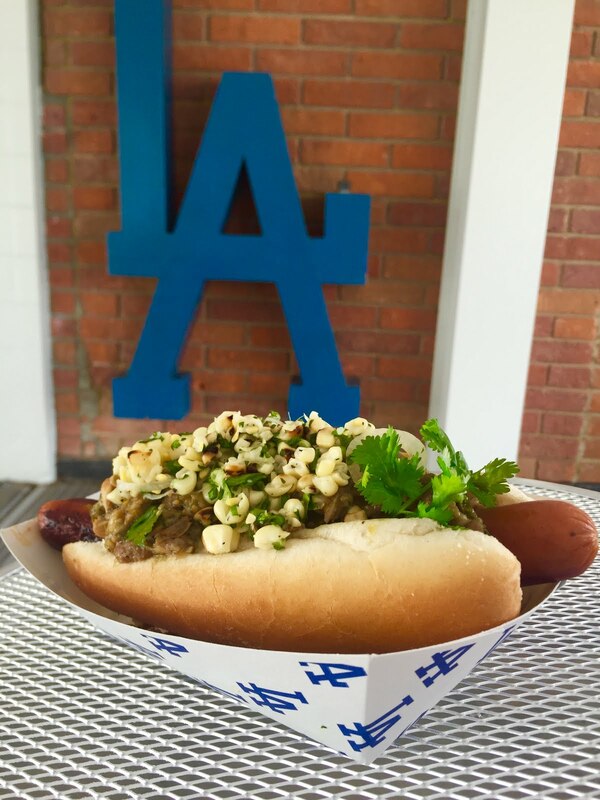 It features a quarter pound, all-beef hot dog topped with pork chile verde and grilled corn salsa. 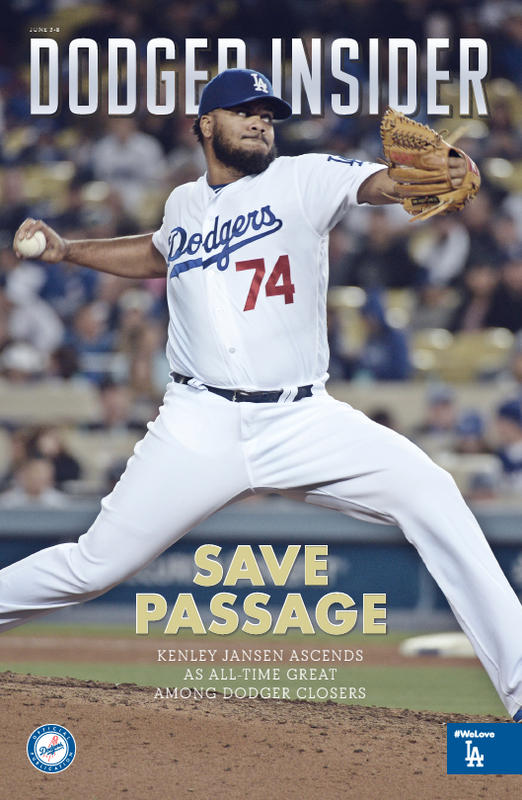 The fifth 2016 issue of the new Dodger Insider magazine, featuring Kenley Jansen on the cover, will be available at Dodger Stadium. (see it on the left). The Dodgers merged their previously separate Playbill and Dodger Insider magazines into one publication (at least 80 pages per issue) with a new edition available each homestand. They are distributed at auto gates (one per vehicle) and via Fan Services for those who use alternate transportation. Monday's game starts at 7:10 PM. Auto gates open at 4:40 PM, and stadium gates open at 5:10 PM. 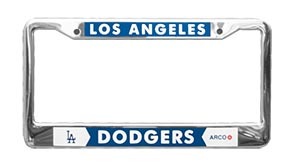 The first 40,000 fans in attendance will receive a Dodgers license plate. See it on the left. The Dodgers will welcome the Los Angeles Rams tomorrow. Rams QB Jared Goff, the No. 1 overall pick of the 2016 NFL Draft, will throw the ceremonial first pitch. Goff will be joined by teammates and 2016 NFL draft picks WR Pharoh Cooper, WR Michael Thomas, LB Josh Forrest, TE Temarrick Hemingway and TE Tyler Higbee. Skirball Cultural Center’s Founder, President, and CEO, Uri Herscher, will throw a first pitch tomorrow. Karla Mosely, who can be seen daily on CBS’ “The Bold and The Beautiful,” will perform the national anthem. The Military Hero of the Game is U.S. Army Staff Sergeant Augie Ortman of Baldwin Park. Ortman is an Explosive Ordnance Disposal instructor at Eglin Air Force Base in Florida. He served two deployments in Afghanistan in support of Operation Enduring Freedom. His awards include the Army Commendation Medal with Valor, two Oak Leaf Clusters and the Army Combat Action Badge. Comedian, actor and producer Mike Epps, best known for his roles in “Next Friday,” “Friday After Next” and” The Hangover” will throw the ceremonial first pitch. The Military Hero of the Game is U.S. Marine Corps Sergeant George Brown of Long Beach, who was a left-handed pitcher for Wilson High School and Long Beach City College. He joined the Marine Corps Reserve after graduating from Wilson High School. His Reserve Unit was activated in July of 1950. After training at Camp Pendleton, Brown was sent to Kobe, Japan to prepare for the first United Nations’ offensive operation of the Korean War. As a crewman of LST, he was on Red Beach the first day of the invasion and helped unload the supplies needed for the Marines to push inland to liberate Seoul. He received the Korean Service Medal with three stars, the Presidential Unit Citation with one star and the Korean Ambassador for Peace Medal. Brown has had a 27-year career as a fireman, engineer and captain with the Long Beach Fire Department. Wednesday's game starts at 7:10 PM. Auto gates open at 4:40 PM, and stadium gates open at 5:10 PM. The first 40,000 fans in attendance will receive a Don Newcombe bobblehead. See it on the right. Newcombe will officially start the game with Hall of Famer Vin Scully’s words, “It’s time for Dodger baseball!” Newcombe was the starting pitcher for Scully’s first broadcast in 1950. Pregame ceremonies will include a birthday celebration for Newcombe who will celebrate his 90th birthday. The Military Hero of the Game is retired U.S. Navy Radioman Second Class Bernard Baima of Burbank. Baima, who is 94-years-old, joined the Navy in 1942 and served in World War II. Born and raised in southern Illinois, Baima enlisted in the Navy in 1942 and served until the end of 1945. During the second World War, he was a radioman on a communications ship that was involved in the invasion of Saipan, Tinian, Iwo Jima and Okinawa. Baima and his wife married in Chicago in 1947, then moved to the Los Angeles area. They have four children and have lived in Burbank since 1977. The Los Angeles Dodgers Foundation (LADF) conducts silent auctions throughout the season featuring signed pieces of memorabilia from Dodger players, coaches and alumni. Auctions take place behind the Vin Scully press box on the club level. The items for auction Wednesday include a Joc Pederson autographed jersey, Orel Hershiser autographed baseball and Clayton Kershaw autographed photo.